The Alien v Medical Science (Part Deux). “You’re cured”. How can such simple words mean so much? And it is not the first time that I have been the recipient of such good news. Twenty years ago, after having undergone surgery to excise a high risk malignant melanoma, I received a similar verdict in the same hospital, the quite unique Christie. Then I stood, this time I was seated. Then my hair was blond, now it is grey. And I am being informed that recent blood tests indicate that The Alien, an aggressive Gleason 8, is no longer in attendance. The PSA level came in at less than 0.1, the testosterone level less than 0.2. Results that I had hoped for were now indisputable hard data. The would be assassin has fled the scene, defeated by the advances in medical science together with the combined efforts of the doctors, nurses, radiographers and many others, some working in distant pharmaceutical laboratories. People who I will never meet. I exit the hospital into a late, cold, darkening wet Friday afternoon harbouring complicated emotions. I am euphoric yet chastened as I remember my mother and all the cherished life-long friends who I have lost, four alone in the last two years. Due to late diagnoses, their prognoses were quite poor. They lasted for only a few weeks. I deeply miss them more than I can put into words. Most of you reading this will share the same feelings of irreplaceable loss. I have looked at some stats. There are approximately 1,000 new cancer cases in the UK per week. And although cancer survival rates are improving, more than 3,000 people die from cancer each week. One quarter of these will last no longer than six months, mainly due to late diagnosis. And, although the UK is the fifth largest economy in the world, Britain has the worst cancer survival rate in Western Europe. How can this equate? Is there something profoundly wrong here? I have always taken great care to maintain an apolitical blog but I am compelled at this point to say that so often I have strongly disagreed with Governments’ (pl) spending priorities. So often I am of the opinion that significant amounts of the public purse are carelessly spent, perhaps squandered on projects, causes that I deem are not nearly as vital as saving, extending, improving the quality of peoples’ lives by providing enhanced medical provision. But enough of this. It’s a worn tired debate. My hat, or yours, thrown into the ring will go unnoticed. Back to the thread. For the second time in my life I have somehow, for no apparent reason, managed to evade the voracious, pitiless grasp of The Grim Reaper when so many countless others have not. Many years ago I reached the firm conclusion based on thinking, observation and evidence, that life is a random, illogical game of chance. We delude ourselves if for one moment, we think that we are in control of our lives, our destiny. Some will simply be luckier than others and no amount of philosophy or theology can make much sense of that because there is no sense or reason to be found. Disappointingly so, there is no Grand Plan. The Gods are cruel and indiscriminate, perhaps even more so than homo sapiens. They give life only to take it away on a whim, a throw of a dice, a spin of the wheel. I am remembering a hymn sung at my old school. One of the lines – “Live every day as if it were thy last”. We should have sung that one line. Every day. Fortissimo. And now what lies ahead a propos further treatment? The thirteen weeks cycle of Prostap injections will continue for a further two years. During the third year the side effects should, hopefully, disappear. But I must be careful to say that side effects can be widely different for every man. For me they mean that I must fight the ever present fatigue each day beginning with every morning. It is ever-present. The temptation to sit and do nothing is to be resisted. It is always a challenge. A test of will power. Resolve has taken the place of testosterone as a driver. However, it is possible to wade through water however deep. And then there are the hot sweats, at the moment 70 – 90 per week. They are quite debilitating. I am presently attending weekly sessions of (western-based) acupuncture at the Christie with the hope that this treatment can, to some extent, alleviate the frequency, intensity and duration of these nuisances. Getting up six or seven times per night to wipe myself dry results in sleep deprivation adding to the levels of fatigue. I will be monitored every six months for the remainder of my life. At present the one major indicator of renewed malignancy is a PSA test and I am, in addition, scheduled to visit the Urology department at the Wythenshawe hospital. I have not been there for some months. I hope there is some kind of trail for me to follow. The numerous signs pointing the way to this department have never worked for me. And at times there are still some residual, quite inconvenient side effects from the month of Radio Therapy that I had in August/September. Scroll back to ” Medical Science v The Alien – A Month of Radiology”. September 16th 2018. And, as a reward for doing so, you will find a photograph of me after my last treatment ringing Emma’s bell. And my music? 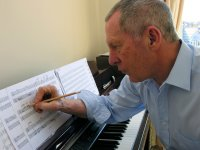 Some years ago when I started this blog it was my sole intention to chronicle my progress as a composer but, as my diagnosis fifteen months ago so changed my life, I decided to write about my life as a composer living with cancer. The rate of my composing has slowed due to the fact that on so many occasions I can barely summon the energy to rise to the cognitive level required for composition. But I have persisted. I have never given up. I don’t give up on very much at all. And I have written many new pieces, all of them of quite short duration and, in doing so, I am nearing the completion of my next project, more of which I will disclose in future posts. And, after this incredible news regarding my health I can settle and write that tenth piano sonata. And the eleventh. And the twelfth. During the last fifteenth months or so I, as a patient, visited three Manchester hospitals – The Christie, Wythenshawe and Trafford. There have been many visits sometimes two, maybe three a week, and on every single occasion I have been so greatly impressed by the professionalism, the singular dedication of the doctors, nurses and all the supporting staff. These are exceptional people working every day under considerable pressures and stress. Their efforts can only be described as truly heroic. And it is because of these people and others involved in the development, the rapid advance of medical science that I can now look forward to extension of my life. I will be forever in their debt. For me now, there is light at the end of the tunnel but, as I look back on the last fifteen months, there was never any other outcome to be considered. Not for one second. One has to always believe and, if there is nothing else, there is always hope.